Lieutenant colonel, infantry, C. S. A., March 16, 1861. Brigadier general, P. A. C. S., June 17, 1861. Major general, P. A. C. S., October 7, 1861. Lieutenant general, P. A. C. S., October 9, 1862.
graduated fifty-fourth in a class of fifty-six. Brevet second lieutenant, Fourth Infantry, July 1, 1842. Second lieutenant, Eighth Infantry, March 4,1845. First lieutenant, February 23, 1847. Regimental adjutant, June 8, 1847, to July 1, 1849. Major and paymaster, July 19, 1858. Brigade, First Corps, Army of the Potomac. August 13, 1862, to August 15, 1863.
battalions of Alexander, Williams, Leyden and Robertson. Pickett's Division also constituted a part of this corps. the Department of East Tennessee. in the Mexican War, where he was severely wounded. Marshall Dent, was a first cousin of Chief Justice John Marshall. Jefferson Barracks, Mo., with the Fourth infantry. Fla., until he was ordered to Taylor's army in Texas. during the battle of July 21st threatened the Federal rear. rank he commanded a division of the army under Joseph E.
Northern Virginia, Stonewall Jackson leading the Second. Chancellorsville and the mortal wounding of Jackson. far, decided to continue the fight on the Federal front. memorable charge against the Federal position on Cemetery Hill. savior of the army on the other side." General Lee, who could never receive amnesty. Military History, vol. 1, p. 660. The facts of history cannot be changed, however, and Wert musters them on these pages to advance a bold claim: "Longstreet, not Jackson, was the finest corps commander in the Army of Northern Virginia; in fact, he was arguably the best corps commander in the conflict on either side." Wert describes his subject as strategically aggressive, but tactically reserved. The bulk of the book appropriately focuses on the Civil War, but Wert also briefly delves into Longstreet's life before and after it. Most interestingly, it was framed by a friendship with Ulysses S. Grant, formed at West Point and continuing into old age. Longstreet even served in the Grant administration--an act that called into question his loyalty to the Lost Cause, and explains in part why Wert's biography is a welcome antidote to much of what has been written about this controversial figure. About the Author: Albert A. Nofi has a Ph.D. in Military History from the City University of New York and was associate editor for many years of the ground-breaking military journal Strategy and Tactics. He was a founder of wargaming, the conflict simulation system used both by hobbyists and military planners. Dr. Nofi has written numerous books and articles on military history and was a news media military commentator during the Persian Gulf War. He is also the author of The Gettysburg Campaign and The Waterloo Campaign. Interpreting Longstreet through the comparison of his methods to twentieth century methods shows Longstreet was a very modern general. Even more important than identifying Longstreet s originality is identifying how his actions greatly added to the changing complexion of warfare. Some of his innovations were the early origins of prominent facets in twentieth century warfare, and he clearly established his legacy as a modern innovator as early as 1862. But only now are the postwar negative portrayals of Longstreet faded enough for him to emerge as the Confederacy s most modern general. Reading Piston's book will demonstrate why Lee described Longstreet as "my Old War Horse," and why Longstreet was widely regarded on both sides as one of the very finest -- if not THE finest -- corps commanders of the war. Piston also does a nice job of disentangling the post-war Gettysburg controversy, which emerged out of polemics over Reconstruction politics and the bickering among former Confederate generals anxious to rescue their own reputations while putting Robert E. Lee above any criticism. Lee, of course, was a great commander, but he never pretended to be perfect, and Longstreet, in daring to criticize certain aspects of Lee's tactical operations, became a threat to a post-war mythology -- the cult of Lee -- that became so important in building a post-war, solid Democratic South and white supremacist post-Confederate Southern identity. As Piston demonstrates, the post-war Lost Cause mythology, in deifying the defeated Lee, required a scapegoat, a "Judas", upon whom the blame for defeat and humiliation could be heaped. 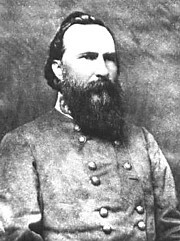 As both Jackson and Stuart had been killed during the war, and as most western Confederate commanders lacked the prominence to serve this function, Longstreet emerged for unreconstructed Confederates as the bete noir of Southern military history, both for his post-war Republican politics and his criticisms of Lee, his actual war record and relationship with Lee notwithstanding. And in this post-war Lost Cause narrative, Gettysburg became the critical key or turning point upon which all else hinged, as though the outcome of a thousand campaigns mobilizing millions of men, fought over five years across a vast continent, could be reduced to one afternoon on one bloody field in Pennsylvania, or as though (even if that had been true) Longstreet alone could be blamed for Lee's failure at Gettysburg. It is the politics of Reconstruction and Longstreet's place in that political struggle that largely shaped what became the dominant Southern narrative about the battle of Gettysburg, and the meaning of that defeat in the larger destruction and humiliation of the Confederacy. Piston's treatment of this issue, and his discussion of the evolution of Lost Cause historiography, is brilliant, and deserves attention not only from those interested in the Civil War and Reconstruction, but from those interested in the relationship between politics, historical memory, the historical record, and the writing of history.